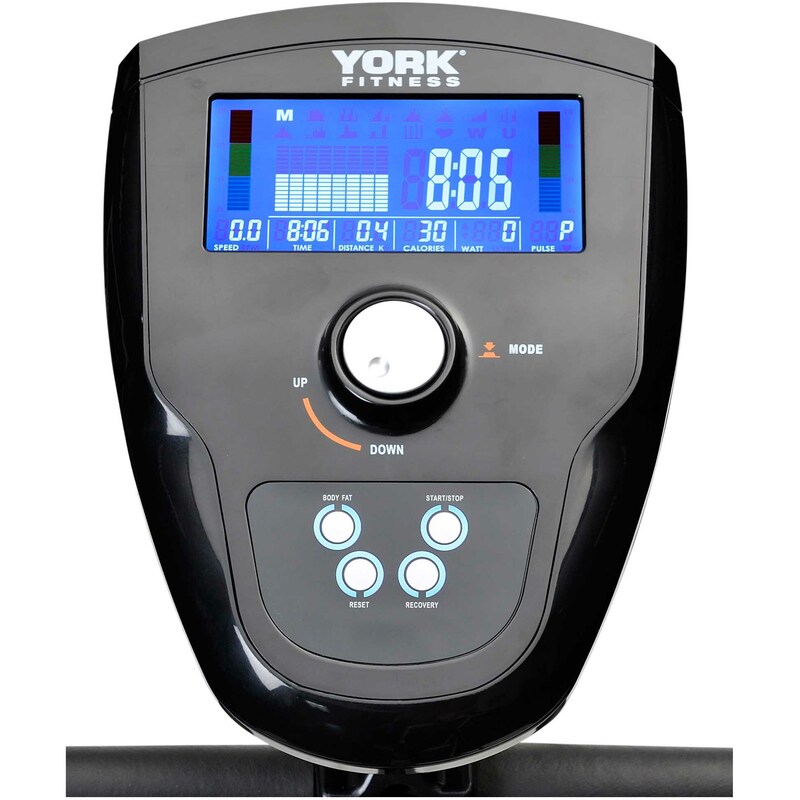 York Fitness have spent decades building up a formidable reputation in the strength arena but more recently have also entered into the UK marketplace with their range of home C.V equipment. They’ve produced ellipticals that have been everything from ‘Which?’ award winning brilliant like the now discontinued, but great, X302 all the way down to the “don’t go near this with a bargepole” variety and plenty in between too! To say it’s been a mixed bunch over the years is an understatement, so how did the York Perform 210 elliptical fare when put to the test? 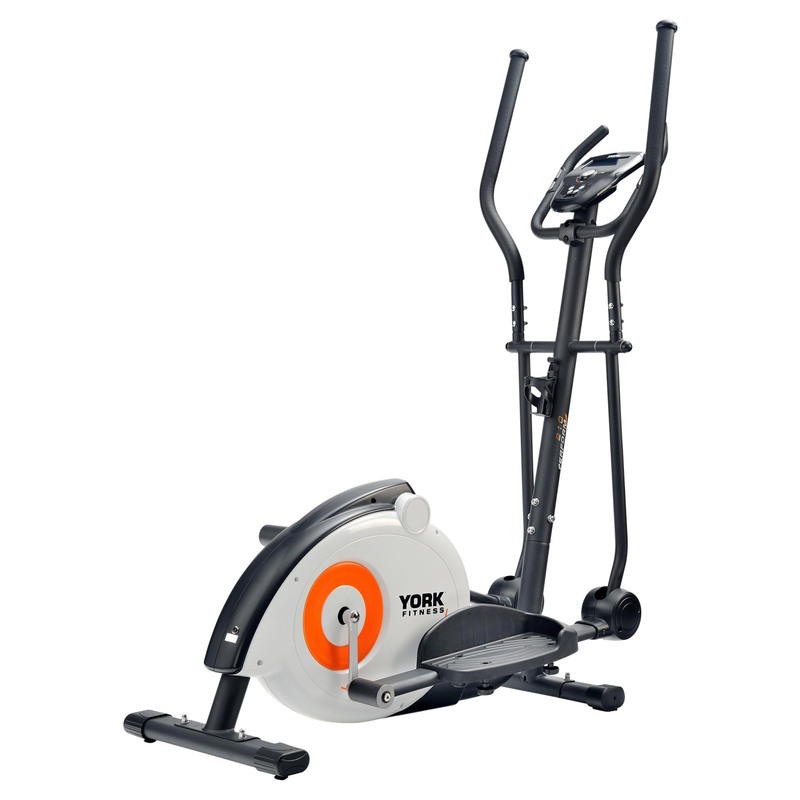 When a manufacturer finds a way to make building cross trainers easy we’ll be delighted but that isn’t going to start with the York Perform 210. Like most other ellipticals each step is relatively simple, it’s just that you have to do everything twice – once for the left-hand side, and then again for the right. The job isn’t made any easier by York’s text-free approach. It works reasonably well but their diagram within a diagram instructions on a couple of the steps take a bit of working out. Here we were helped by the experience of having built a silly number of cross trainers over the years. Still, with a bit of patience, most people will get there in the end. In terms of looks, York have definitely opted for function over form here. It’s not the best looking machine and it definitely gives the impression that just enough plastic to cover the internal moving parts has been used with the design process stopping there. So the Perform 210 didn’t get off to the best start, but how does it actually perform? The 7kg (15lbs) flywheel does a reasonable job in keeping the action smooth all the way through the cycle though when some of the more ‘robust’ members of our team climbed aboard they reported feeling a slight surge in speed just as they passed the point of no return. This isn’t entirely surprising as on an ellpitcal, unlike an exercise bike, the rotating mass of the flywheel has to contend with the full weight of the user. So, as far as the action is concerned those that are of slimmer build will get a smoother experience than those who are heavier set. Also, the 14″ stride is quite compact, again making this model more suited to those of average height or the more vertically challenged among us. There are 32 levels of resistance controlled via the console and the time to get from min to max resistance is quick enough to make the Perform 210 suitable for interval training. We did find that highest resistance level wasn’t all that high though it’s still probably challenging enough for the casual type of user that York seem to have targeted this model at. Whether it’s just the particular unit that we received or whether this is generally how the resistance levels on this model are is hard to say, but there are usually slight variations of max resistance between one unit and another. The console itself features a 5.5″ (120cm) 3-colour LCD which has good contrast and is nice and bright. There is an extremely simple set up with four main buttons and a dial, plus a mode button. The use of a dial makes entering your personal details, adjusting resistance, selecting programmes and pretty much anything else you need to do really, really quick and easy. Dials are a nice way of going about things rather than having to repeatedly press buttons and also have the benefit of generally lasting longer for obvious reasons. The Perform 210 has an impressive 22 programmes consisting of 12 preset, 4 user-defined, 1 watt control and 4 heart rate control workouts. The preset programmes are scalable so you can always choose your favourite workout and keep making it harder and harder as you get fitter which is a nice feature. The heart rate control programmes consist of presets 55%, 75%, 90% and you can also choose your own target. Programming your own programmes is made nice and quick due to that dial and they are all automatically saved for use later. In short, the console and the training options it provides is actually pretty good. However, there’s a problem with the heart rate control element. Heart Rate Control programmes really only work properly when used with a wireless chest belt because chest belts provide a far higher degree of accuracy than hand pulse sensors, which are notoriously inaccurate. Unfortunately, the console on this model does not have a wireless receiver built into it so whether you’re really working out at 90% of your max heart rate, or at a potentially dangerous 97% of max heart rate is brought into question. To make matters worse there are no hand-pulse sensors on the moving handles so you have to isolate your lower body by holding on to the fixed handles, preventing you from being able to ‘cross’ train and use the HRC programmes at the same time. At best this smacks of a serious lack of attention to detail, at worst it makes using the HRC programmes potentially dangerous. Our advice if you do want to use the HRC function is to stay away from high percentage targets or alternatively go old school and invest in a proper heart rate receiver watch, use that to set your target training zones and then use the manual mode on the console to alter the resistance. On a more positive note, the maximum stated user weight is a really surprising 150kg (330lbs)!!! So this does make the Perform 210 suitable for a wide range of users, not to mention very sturdy indeed, but as mentioned earlier, if you are approaching that sort of weight you shouldn’t expect the smoothest of actions on this particular cross trainer. The York Perform 210 is not currently available from any retailers we're aware of in the UK. York have once again proved that they're capable of producing machines ranging from 'must have' to 'skip this one'. We can put this particular York cross trainer squarely into the 'skip this one' category. If you're looking for a compact, feature rich and well built elliptical and were considering the Perform 210, then we'd strongly suggest taking a look at the Viavito Sina which has a heavier flywheel, features a wireless heart rate receiver and is also covered by a 2-year warranty and costs less. Alternatively, if space isn't a problem, then it's hard to see past the Proform 450 LE which is currently on offer for just a little more with a spec that blows the 210 out of the water!